What's the best solution for getting a yard scraper tractor up a slippery ramp? Take a high-speed backwards run at it to gather momentum; or have a driven front axle for extra grip? It's the latter option that clearly makes more sense and the reason that a four-wheel drive version of the 47hp TAFE 45DI OIB was chosen for scraping duties by J F Cobb & Sons, a fourth generation partnership in Dorset. "To shift slurry into a large lagoon, the tractor has to push it up a significant slope that gets very slippery," notes David Cobb. "With four-wheel drive giving you a lot more traction, the job can be done easily and safely." This most recent addition to the Cobb family’s tractor fleet is one of three TAFE models working across an impressive dairy operation with more than 1,100 pedigree cattle forming the Chalclyffe herd of Holsteins. The partnership consists of brothers David and Alan, David’s son Nick and Nick’s wife Polly. The farming operation was started by David and Alan's grandfather at West Chaldon in 1928 and puts a lot of emphasis on high cow welfare to produce top quality milk. It all goes to Dairy Crest and most ends up on Marks & Spencer supermarket shelves. With cows housed much of the time indoors, the scraping tractors have a demanding workload – all the more so when the cows are milked three times a day through the herringbone and rotary parlours. The TAFE trio has taken the place of both old and modern power units for the daily yard scraping routine. There are two examples of the 37hp TAFE 35DI OIB and the four-year-old one has clocked up more than 5,000 hours of reliable service. One has the driving position open to the elements, while the other has the optional cab, as does the four-wheel drive machine. "The youngsters tend to like a cab and radio, while the older drivers are happy with an open tractor that's easier to hop on and off," notes David Cobb. "It depends how much outside work they do – but if we have to move a tractor to our calf unit, it's a half-mile drive and that's not very popular on a tractor without a cab!" "The simple 8x2 gearbox is also just right for the scraping job because it's slick and has matched forward and reverse speeds." A number of different scraper tractors have been tried but the TAFE machines, built by Tractors & Farm Equipment, one of the largest manufacturers in India, have stood the test of time. "We used to have Ford 4000s, and they were pretty good but you can't get half-decent ones for sensible money any more," Mr Cobb points out. "We've also had more modern tractors with electric shift but they cost a fortune and break down." In contrast, the TAFE tractors are about as simple as you can get and give very little trouble, he adds. Repairs are more the result of the way they are driven and the inevitable bumps that occur when operating in and around buildings the whole time. "We've replaced front wheels and the odd kingpin, and also some three-point linkage stabiliser chains – but only because the yard scraper hit a gate post," Mr Cobb recalls. "The thing is, parts are relatively cheap to replace and even if something gets damaged it doesn't usually stop the tractor from finishing the job." There is little downtime to get the tractors serviced. 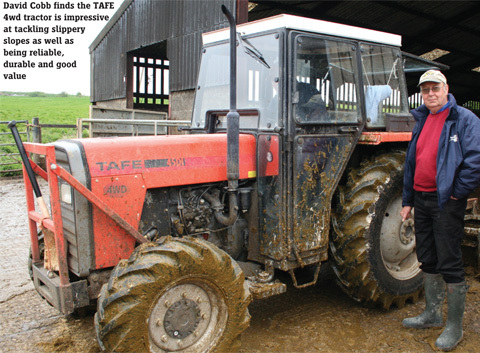 Routine 250-hour services are handled in-house but the more thorough 1,000-hour service is entrusted to agricultural engineer Martin Richards, whose Tractors UK operation imports the TAFE machines. "The tractors may look a bit old-fashioned but their engines are modern and the oil-immersed brakes of the OIB models are ideal for scraping duties, unlike old tractors with exposed, dry brakes," he points out. "The simple 8x2 gearbox is also just right for the scraping job because it’s slick and has matched forward and reverse speeds," he adds. "On tractors where they’re not matched, drivers will tend to slip the clutch all the time rather than shift two levers every time." David Cobb admits to being surprised that the TAFE tractors have been so durable and reliable: "They do the job just as well as any other tractor and they’re cheap to run," he says. "They're also the right size for this work – they’ve got the weight and power needed to push the slurry around but they’re not too big for work that involves driving in and out of buildings all the time, and around tight corners." If we have to repair anything it's usually because the nut behind the wheel hit something rather than a problem with the tractor!